When a mentally ill woman is the only witness to a murder, her family rallies around her even though it means running all over Las Vegas in this hard-hitting but affectionate debut. Local prostitute Bebe Small has been brutally murdered and dismembered, and Helen Taylor is the only witness. That’s a problem for Detective Jake Madison, because Helen didn’t see just Bebe’s death—she also sees and chats with her long-dead husband, Bobby, more than she does with the living. The police take her into protective custody, but Helen won’t listen to anyone but Bobby as a parade of colorful characters, including hard-partying lesbian hairdressers Hope and Rasheeda, comes and goes in the holding cell. Finally, Jake tracks down Helen’s sister, Pat. Pat pulls into town with her teenage boys, Jordan and Marc, to rescue her sister and checks them all into Caesar’s Palace. Not convinced that Caesar’s is the most therapeutic environment for Helen, Jake suggests she enter Mind Care, a mental health treatment facility run by Dr. Ingrid Urbane, his perfectionist girlfriend. While Helen gives treatment a try, Pat purges and fumigates Helen’s derelict house, Jordan leaps at the chance to become an entrepreneur running Helen’s stall at the swap meet, and Marc gets busted peeping at casino dancers. As the psychiatric treatment starts to take effect, Helen can’t bear to lose Bobby for good, so she sneaks out of Mind Care and hits the town with Hope and Rasheeda. When the killer strikes again, can they prove Helen’s innocence? 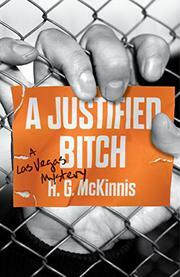 Fast-paced, funny, and gritty—the perfect read for lounging by a casino pool.